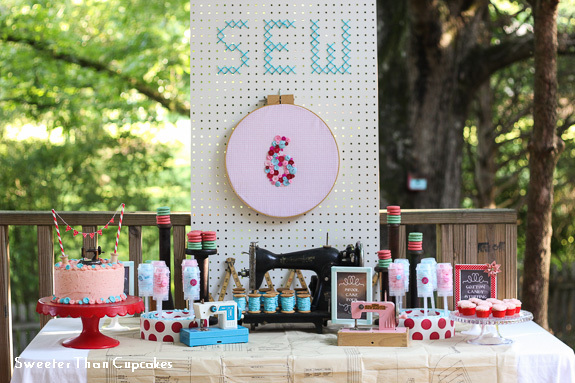 When Avery latched on to the idea of a sewing birthday party for her 6th birthday, I tried not to get too excited. After all, the day after her 5th birthday is a bit early to assume a 5 year old won’t change her mind. Well the idea stuck! (I guess this would be the positive side to her stubborn streak.) You’ve seen the dress and the invitations, now here’s all the rest! The party started at 10:00, so we offered a couple brunch type snacks in the form of yogurt parfaits and sausage cheese balls. 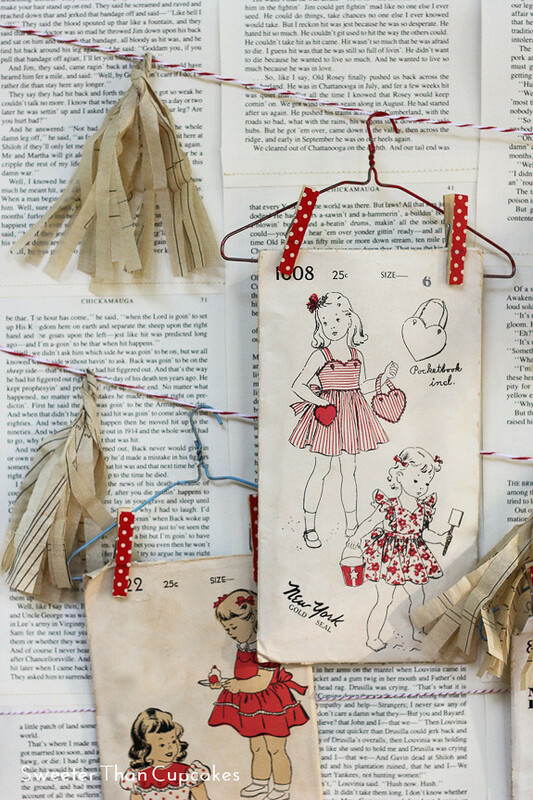 I tied in vintage finds from both of Avery’s grandmothers in the backdrop with the doll clothes hangers and children’s patterns. A not so vintage pattern sheet I would never use made for fun tassels. 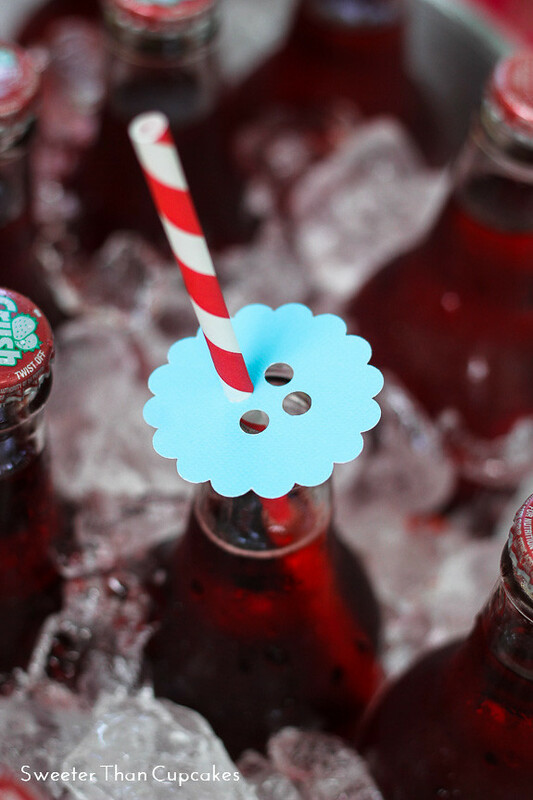 The straws were outfitted with paper buttons. 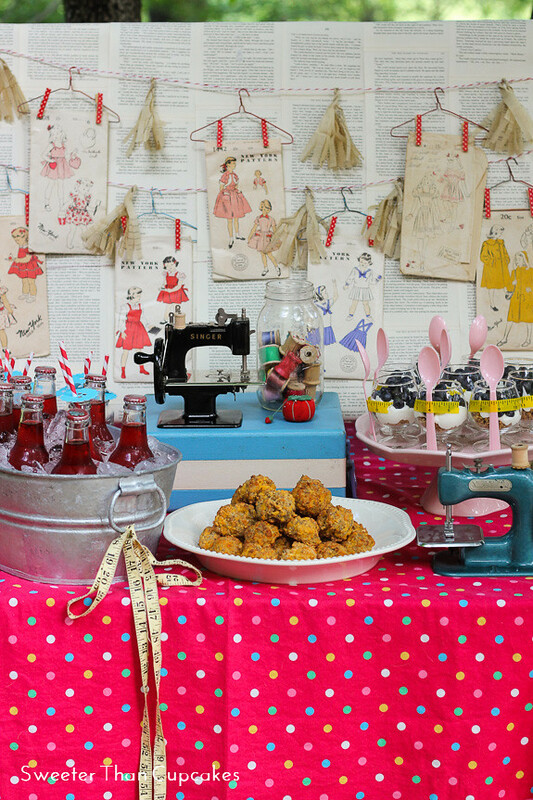 If you are going to have a sewing party, there’s got to be things to sew!! In the interest of safety, especially for the younger siblings that would attend the party, I kept the sewing limited to kid friendly plastic needles. 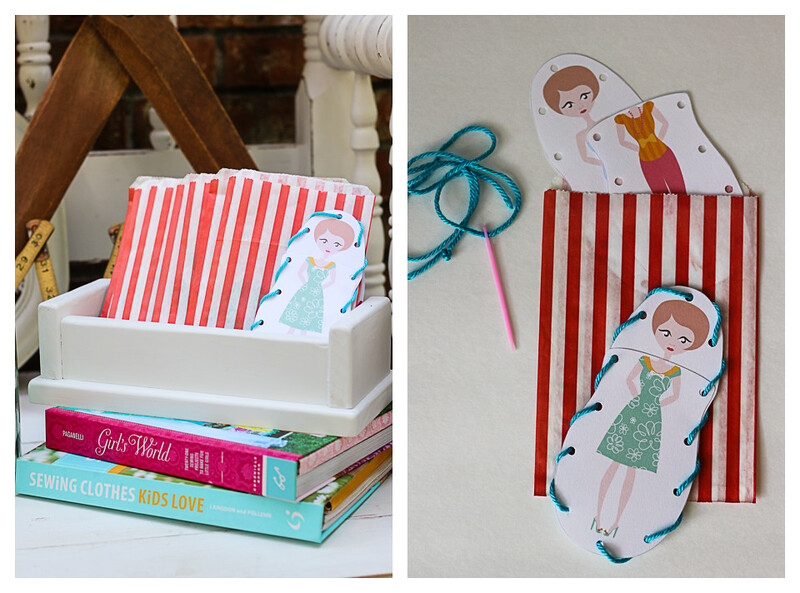 First up, the girls each received a bag with a paper doll lacing card. 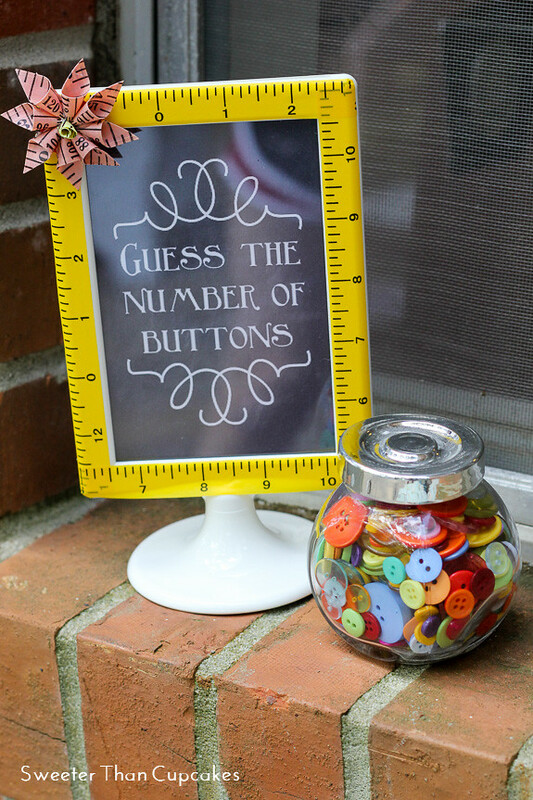 You can find the free printable I used here. 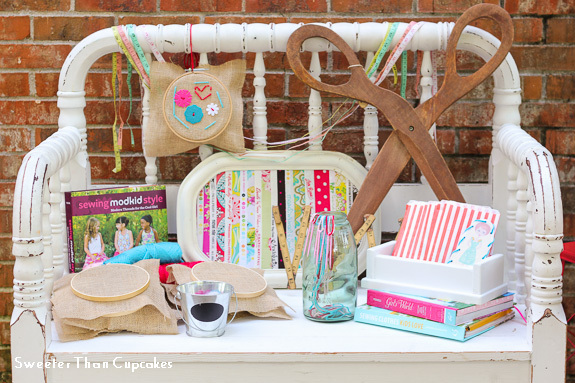 Next up, each girl had a blank burlap embroidery hoop to embellish to their hearts content. I was thrilled to find these felt buttons at Wal-mart since the plastic needles would not work with standard buttons. 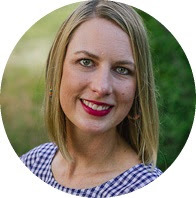 You can see Avery’s sample hoop in the display photo above. We also played a little guessing game. We’ve finally arrived at the dessert table! 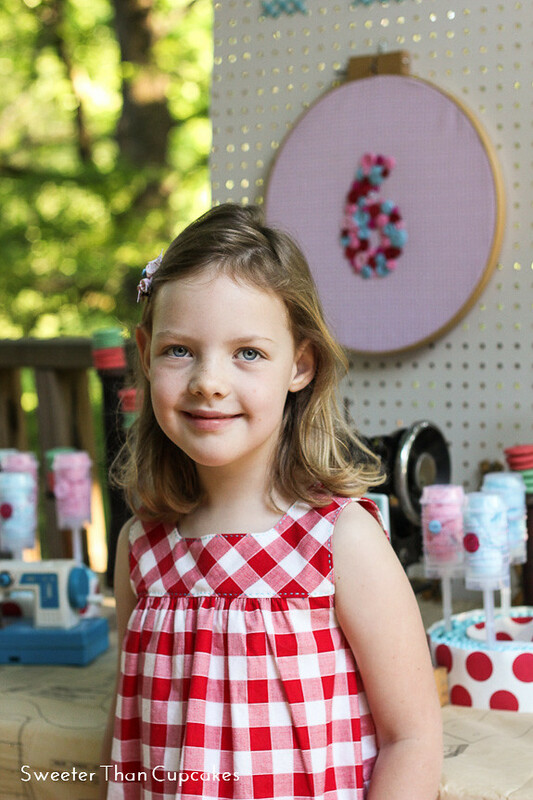 Avery actually stitched the “sew” in the pegboard backdrop, and I created the button six embroidery hoop. 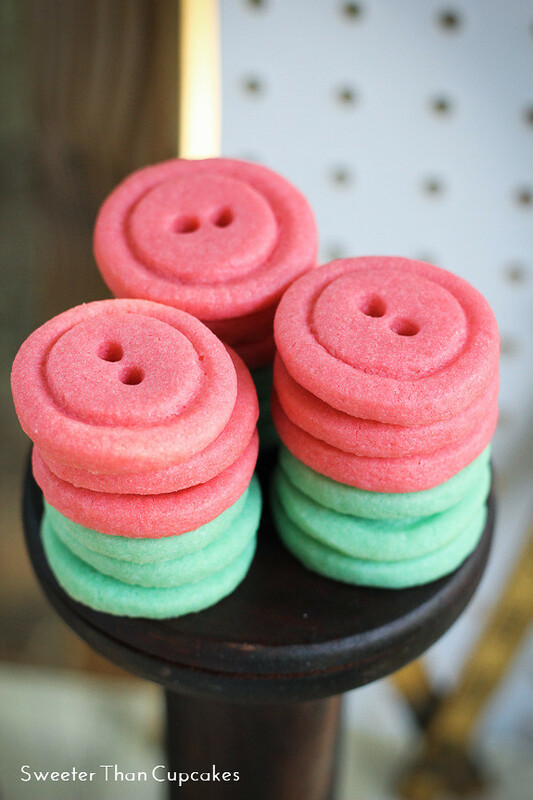 The button sugar cookies rested on vintage wooden spools. The strawberry cake featured a miniature (dollhouse maybe?) sewing machine my mom found while antiquing. 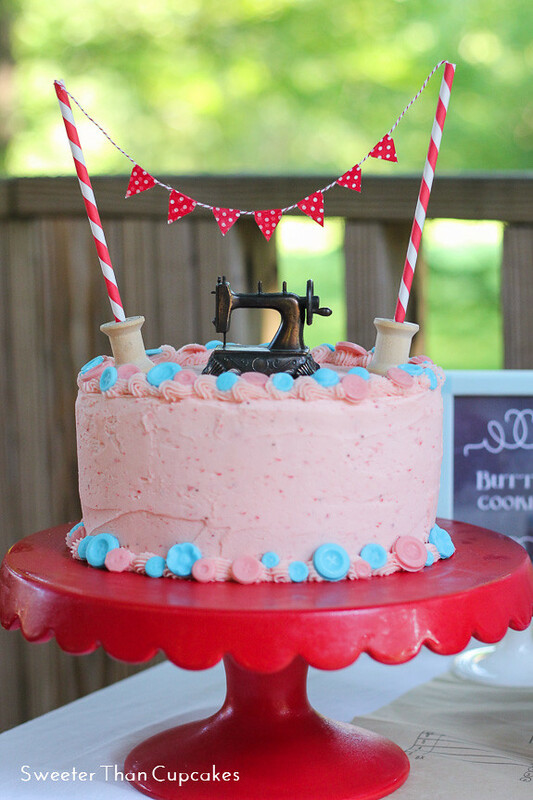 The tiny washi tape bunting is held in place by paper straws and spools. 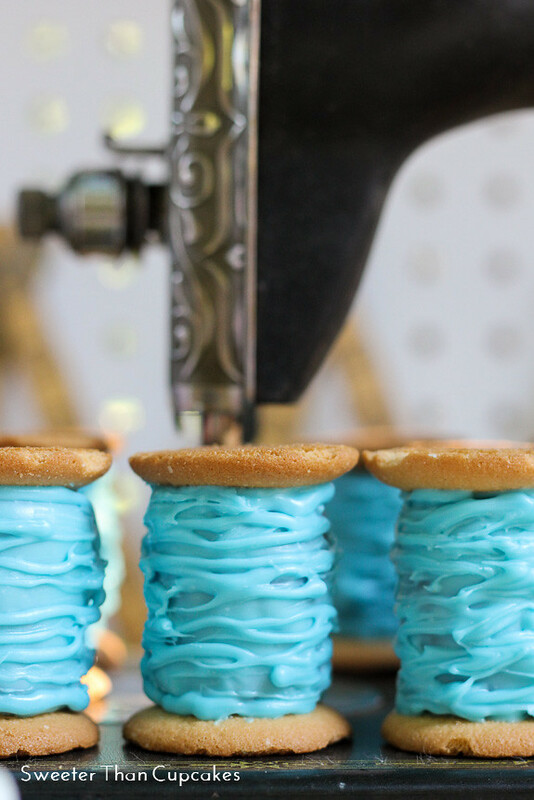 Candy melt buttons trim the top and bottom edges of the cake. My first attempt at the strawberry cake sunk in the middle. The best thing to do with a “ruined” cake, is make cake pops! 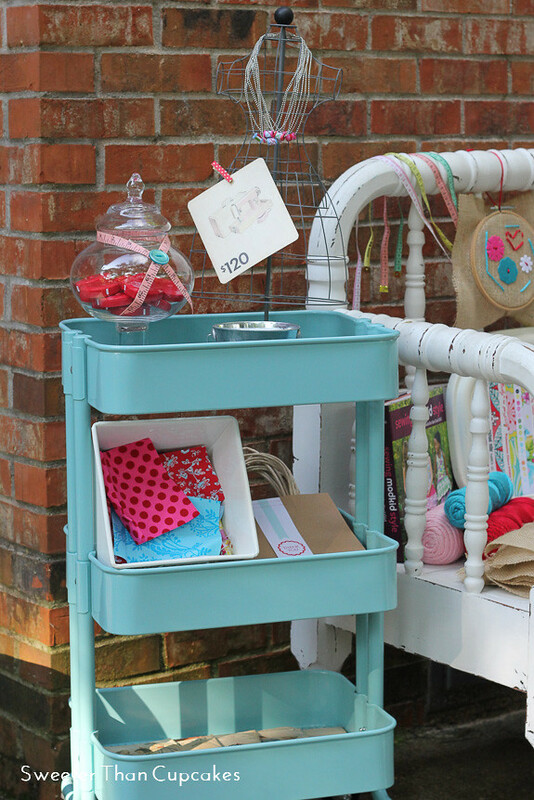 The vintage sewing machine I scored at a garage sale was a beauty in the rough. The best thing about spool cake pops is they don’t need perfectly smooth sides. 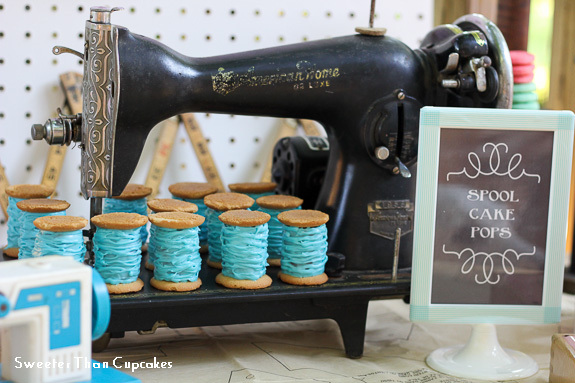 Nilla wafers made for quick spool tops and bottoms. 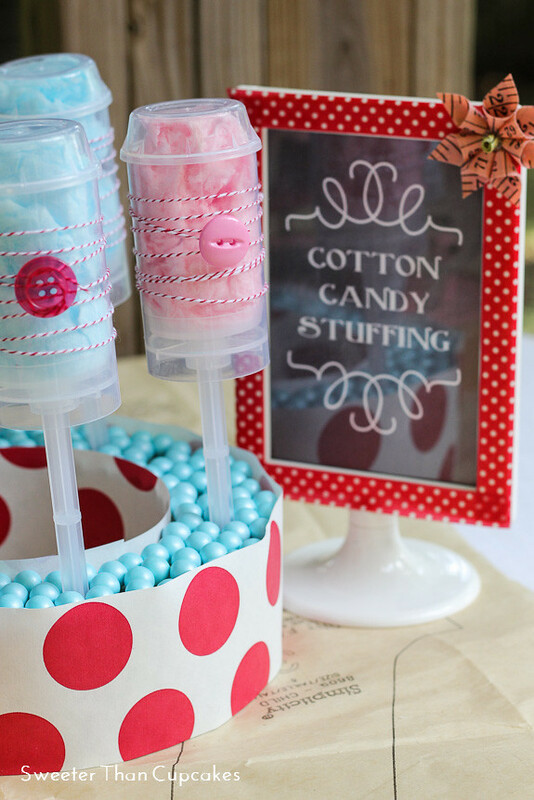 Every once in a while sewing requires a little stuffing, so we threw in some cotton candy push pops for more fun. I can never send guests away empty handed, so we had a little favor station. 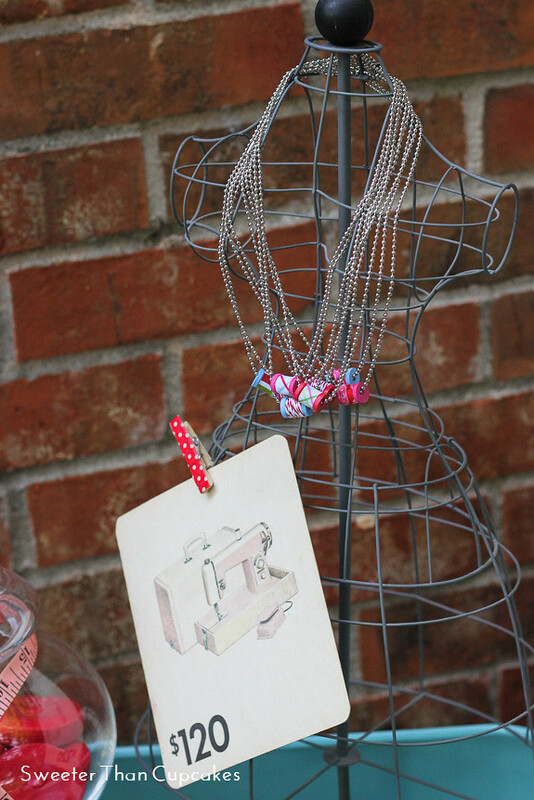 The mini spool necklaces came from this tutorial. 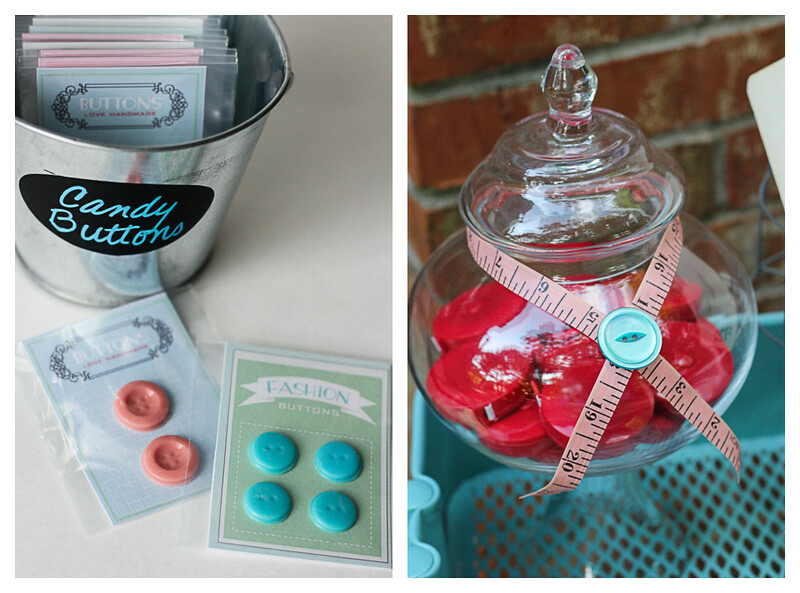 More candy melt buttons on printable button cards and measuring tapes were up for grabs as well. 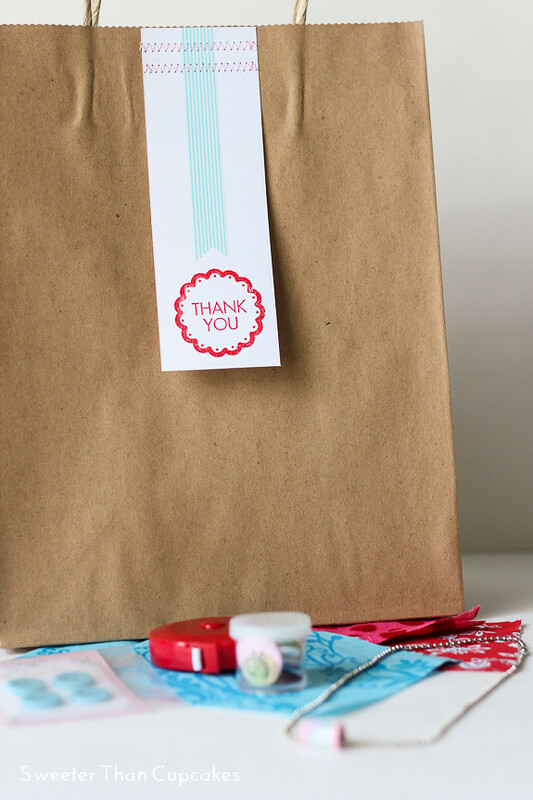 I dressed up craft paper bags with sewn tags to carry the sewn projects and favors home. 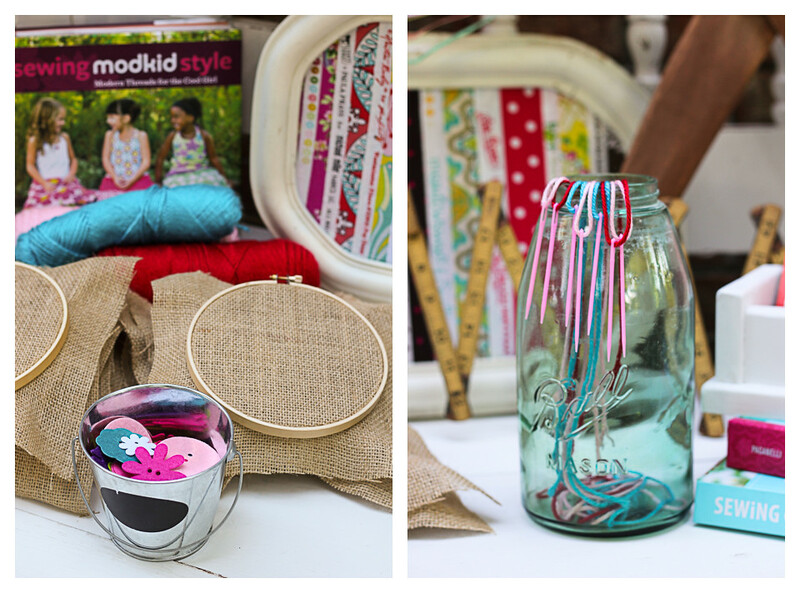 Little button cups and lots of fabric scraps were sent along to continue the fun at home. That’s a wrap! This 6 year old certainly had a special day being creative with her friends. In case you are wondering, discussions of next year’s party have already begun. I’m hoping the watercolor party sticks and the Frozen party fades, but only time will tell. Love this party! All the details are so fun! Thank you! It certainly was fun to pull it all together!